Quick Response Manufacturing (QRM) is a process improvement method developed from the standpoint of logistics, like Lean and the TOC. QRM focuses on gaining time from order to delivery. Reducing the Manufacturing Critical-path Time (MCT) is the holy grail, because this will result in shorter lead and delivery times. Less obvious is that the production costs will decrease. The reason: hidden costs are reduced. Costs are saved because of among others less work-in-progress, less mistakes, less telephone calls from customers about late deliveries, and less stock of products which possibly cannot be sold. To implement QRM, adopting a process-oriented way of thinking is a condition. Higher costs during individual production steps should sometimes make done with, because this brings advantages in other departments. QRM and the accompanying Kanban-variant POLCA are already sucesfully applied for ten years in the US, mainly by companies that make customer-specific products. Examples are Harley-Davidson and JoyGlobal, a multinational that manufactures mining machines. During the last 5 years QRM also catches on in Europe. This is demonstrated by applications of QRM in Dutch companies like Interfocos and BOSCH Hinges. To reduce the Manufacturing Critical-path Time, it is needed to reform your business-organization drastically, from functional to cellular. One way to do that is to reorganize the complete company, from the office to the shop floor, by forming work cells. Each of those cells is staffed with three to ten persons, and each cell performs a group of similar tasks. To keep the throughput time short, the work-in-progress per workcell should be kept small. Big product batches are therefore absolutely forbidden. In addition, each cell is staffed by a multidisciplinary team and, if necessary, group members can take over eachother's task. The first version was published in a Dutch specialist journal, PT Industrial Management. Since then, the article is regularly updated. In Quick Response Manufacturing (QRM) reducing the Manufacturing Critical-path Time (MCT) is the holy grail, because this will result in shorter lead and delivery times. Less obvious is that the production costs will decrease. The reason: hidden costs are reduced. Costs are saved because of among others less work-in-progress, less mistakes, less telephone calls from customers about late deliveries, and less stock of products which possibly cannot be sold. 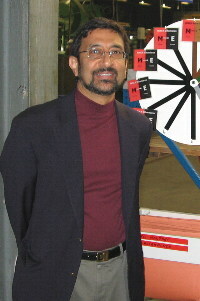 Rajan Suri is not only a professor at the University of Wisconsin-Madison, he is also the founder of the method ‘Quick Response Manufacturing’ (QRM). According to Suri, reducing the lead-time should be the top priority in every company that makes or assembles ‘customer-specific’ products. In that situation, lead time reduction not only means shorter delivery times, but also entails lower costs, due to less inventory, less mistakes, less telephone calls about late orders etcetera. The result: an ideal competitive position for your company, because you can deliver customer-specific products fast and at a relatively low price! To reduce the throughput time, attention should be given to the entire route from order to delivery. The current generation of accounting systems don’t do that, these systems focus on the costs per department. Wrong, says Suri. If you do that, applying QRM seems to increase the costs, which is not true. Take for example the shop floor. To increase the throughput there, the work-in-progress should be reduced. This means smaller batch sizes, and thus more changeovers. To attain that, investments in extra people and/or machines maybe needed. On the other hand there are however huge savings, but those savings are realized in other departments such as warehouses. Suri expatiates on QRM during a workshop1, attended by 30 managers. In general those managers represent companies that either engineer or make their products to order. These companies are the ideal target group for Suri. In spite of his rather American approach, Suri holds his audience in suspense for hours. A lot of his sheets are filled with dollar signs, and a favorite slogan of Suri is: “time is not money, time is a whole lot of money’. Suri asks his workshop-participants to find potential savings by applying QRM. Some of the suggestions in my group are smaller warehouses and less handling. QRM overlaps with other methods to improve business processes. The focus on throughput, and the plea for an accounting method which looks at the overall costs is shared with the Theory of Constraints. Value Stream Mapping is used to identify wasteful activities, this technique is borrowed from Lean Manufacturing. Finally, an important tool within QRM is the formation of multidisciplinary teams, that ‘own’ certain business processes. This approach QRM shares with the improvement method Total Productive Maintenance. More precisely, QRM proclaims that minimization of the Manufacturing Critical-path Time (MCT) should be the Holy Grail. The amount of calendar time from when a customer creates an order until the first piece of that order is delivered, through the critical path. 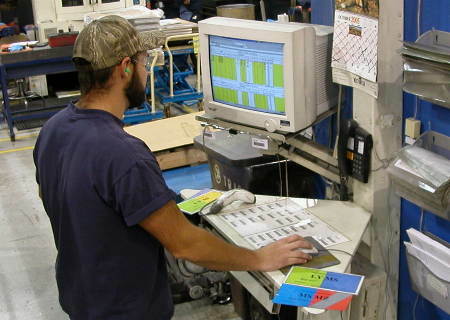 An operator at Alexandra Extrusion (Minnesota) plans work with POLCA-cards, one of the QRM-tools. To reduce the MCT it is needed to reform the business-organization drastically, from functional to cellular. One way to do that is to reorganize the complete company, from the office to the shop floor, by forming work cells. Each of those cells is staffed with three to ten persons, and each cell performs a group of similar tasks (such as the execution of similar manufacturing processes). To keep the throughput time short, the amount of work-in-progress per workcell should be kept small. Big product batches are therefore absolutely forbidden. In addition, each cell is staffed by a multidisciplinary team and, if necessary, group members can take over each others task. To cope with peaks in the demand, the average workload of man and machines may not exceed 85%. ‘If a worker has time to spare, he or she can use that time to think about process improvement’, says Suri. Fine-tuning a workcell – how many people and/or machines are necessary, what is the optimal batch size – is not an easy task. If different processing steps needs to be taken care of, in varying order, system dynamics can lead to unexpected results. In that case, simulation might help to detect and remove bottlenecks. It is a challenge to make the orders flow from workcell to workcell. One method to control this is the POLCA-system, which is a variant of Kanban. Until 2007, implementations of POLCA and QRM were still rare in the EU. However, the tide is turning, as more and more companies are now struggling to produce tailor-made goods. Will QRM, ten years after the introduction by Rajan Suri, finally become popular worldwide? Interfocos makes 98 types of stoves. When you take into account that a customer can choose between several energy sources (wood, natural gas or propane), colors, and different types of interior work, then there are thousands of stove versions possible. Cards for POLCA, a Kanban-variant for QRM. The cards shown here were used during an exercise in 2007, which preceded the implementation of QRM at “BOSCH Hinges”. This is a Dutch company which produces hinges. Workcells passing work to each other are still missing within Interfocos. Therefore the question arises why the organizational change is flagged as QRM. After all, the are a lot of companies who introduced a process oriented way of working, but these do not call that QRM. Thanks to these kind of improvements, the delivery time of the stoves has already been cut in half. ‘Now, we are busy rolling out QRM to other product groups. In addition, we will investigate if we can use the Polca-system for some of our planning processes’, Luiten concludes. It is also possible to implement the Kanban-variant Polca, disconnected from the rest of QRM. This is proven in the next case, BOSCH Hinges. This is a rather small Dutch company, which has no connection with Bosch in Germany. Godfried Kaanen, general manager of BOSCH Hinges: "When I believe in something, I take decisions quickly"
The well-known Kanban-system, as developeed by Toyota, is widely used to gear the activities of work centers. After consumption of a small amount of certain items, a workcenter signals the need for replacement by sending a Kanban-card to the preceding workcenter. So, Kanban is essentially a pull-system. However, Kanban only works if the intermediate stock – which can be many items - is always the same. This is not the case with made-to-measure production, because then all products are different and so are the components needed to built them! The use of Polca-cards instead of Kanban cards overcomes this drawback. A Polca-card does not signal the need to supply a specific item, but only sends a message to a preceding station that there is free capacity to receive and process semifinished products. Because a cell can't produce items for a workcell that didn’t send a Polca-card, it is prevented that workcells become overloaded with work. ‘Polca makes semifinished products dance across the working floor’, says Rajan Suri, who invented this system. 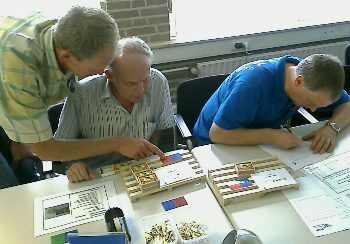 In 2007, employees of “BOSCH Hinges” practiced with the Polca-system. 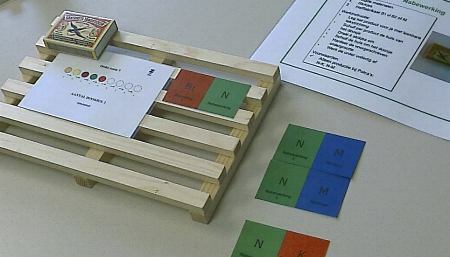 Match boxes stood model for materials, to be exchanged between workcells. Interfocos and BOSCH Hinges both consider QRM as supplementary to Lean Manufacturing. So, it can be concluded that QRM is a method to adapt Lean to a situation with customer-specific production, and/or high variety production, and/or short product lifecycles, and/or a very volatile demand. To conclude, when you deal with one of those situations, it is certainly worth the effort to study QRM. That is even more the case, if your company can gain a competitive advantage if it can deliver products faster. Then, the question if QRM will lead to return on investment operationally, becomes less important. 1) The first version of this article, published in the Dutch specialist journal "PT Industrieel Management", was based on information gathered during a workshop QRM, given by Rajan Suri at LeanTeam consultancy. Additional information came from interviews (originally in 2007) with people from Interfocos en Bosch Hinges. The content of this article is regularly updated.